Oshan essentials brings you a luxury skin care line from the islands of Hawai'i formulated for women of the sea, to quench dry skin and counter the cumulative effects of sun damage. Oshan oils are luxurious botanical blends that nourish and rejuvenate skin into glowing health and sublime softness. 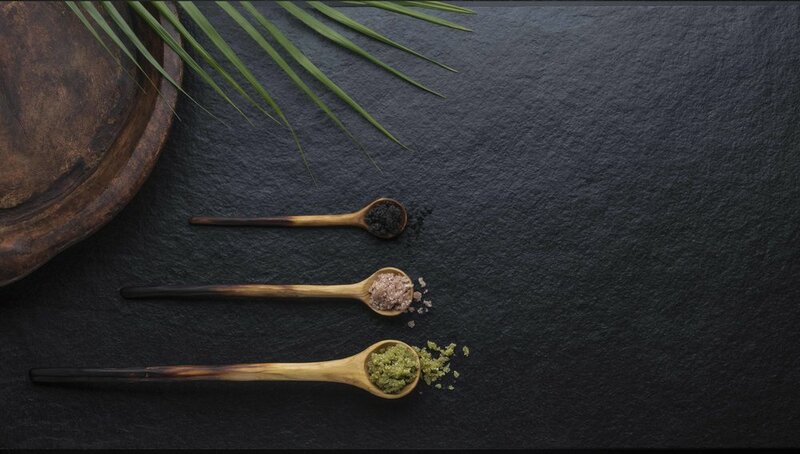 Our natural ingredients are known for their restorative, anti-inflammatory and anti-aging properties. They increase elasticity while revitalizing and nourishing dry and sun damaged skin, delivering nutrients deep into the skin. Our formulas are handcrafted in small batches without any toxic additives, using only pure, organic, wildcrafted, ethically sourced ingredients of the highest quality. One of our goals is to promote the ritual of self care. We rarely get to escape the demands of modern life, the bath is of the last places we get to disconnect from it all, and it is where the opportunity to reconnect to ourselves emerges. Give your body ten minutes of mindful attention, creating a profound and loving relationship with your physical body, calming your mind. We hope our products encourage you to slow down and appreciate the simple moments in life. Being located in one of the most isolated places on the planet, we try to be super resourceful with much respect to our 'Aina. All our containers, boxes and labels are made in the USA, supporting domestic jobs and reducing carbon footprint of shipping. We use glass containers, which are infinitely recyclable. They are perfect for traveling in style- just refill from your full size product. Our packaging fillers are Hawaiian papers that we shred, and occasionally we try to reuse bubble wrap and packing peanuts that were sent to us from our suppliers. Our shipping boxes and packing material are made from 100% recycled post-consumer content. Please always recycle! In 2006 I was competing in the Israeli surf circuit, constantly in the water or in a hot yoga room. While attending hot yoga teacher training in California, I was introduced to essentials oils and personally experienced their benefits on my own body. I was taking 2 hot yoga classes a day, surfing on my every spare minute- my muscles were the most fatigued they had ever been. Peppermint essential oil worked wonders on relieving my pain, so simple. Intrigued by these ancient oils, I dove into studies of aromatherapy, herbalism and natural perfumery. Through my research I found an old hebrew book with ancient remedies dating back to biblical times. I started crafting skincare products for myself, family, and friends, in search of the most healing ingredients, and a product that will not leave me slippery on my board or in the yoga room. You seem to know everything about what natural ingredients do for your body, how? My fascination with nature and botanicals dates back to my childhood. Growing up as a competitive swimmer taught me from an early age about the human body and made me very much connected to my own. In high school I majored in biology, then went on to study designat the Bezalel university of art and design, taking extensive courses in human anatomy. Israel is known for the dead sea and the healing properties it has for the skin. I lived about an hour away from the dead sea, and worked for a cosmetic company specializing in dead sea salt products. Seeing first hand people battling terrible skin conditions, being healed by these natural compounds was eye opening. Seeing the dead sea slowly disappear due to extensive harvest of the salt was devastating and eye opening as well.. I myself was diagnosed with a rare skin disorder that has no cure or treatment in conventional medicine, which led to a journey of exploration, spending hours reading to find I was able to manage it using essential oils and acupuncture. I worked closely with a team of aromatherapists and dermatologists in creating the line- each contributing valuable perspectives to the product development. Becoming a yoga teacher transformed me in further deepening my holistic approach to life. Living an organic and active lifestyle, I believe plant medicine is the effective in calming the mind, nourishing the body and enliven the spirit I use essential oils and herbs everyday, on all members of my family, and am kind of the village shaman-always carrying different oils, creating blendswhenever anyone is in need. What island are you from? Ilive on the north shore of Maui with my husband David (founder of Hawaiʻi off grid architecture and engineering) our daughter Ella Reef, and our chocolate Lab Nesh. We have a farm on the way to Hana, where oshan studio and lab is currently under construction and will be 100% off grid. David and meare the design/buildingforce, working on the house on the weekends and sometimes at night. Our project includes eradicating invasive plants and planting indigenous plants on our farm, mainly Royal Hawaiian sandalwood. We feel honored, fortunate and gratefulto be living onthis island and are passionate about preserving and bringing the habitat back to its primal condition. Our off grid project is being documented by HGTV in strive to inspire others to have a more sustainable lifestyle. What inspired you to start Oshan? It's simple -I wanted to create something that I needed and could not find. Thoughtfully sourced, simple yet luxurious products to heal sun drenched souls. Moving to Hawaii was my dream. I had a successful jewelry brand I started in Israel in 2005, which I kept managing from afar when we moved. After a decade of being emerged in the fashion world, I longed to do something with more depth, that will make a real difference in peopleʻs lives. I was surfing every day for 3-4 hours, enjoying the pacific ocean and sun. Then I became a mom, and saw the difference a few rare moments of self care can make, learning to cherish them. I wanted to share my passion for essential oils and wellness. Our friends started manufacturing macadamia oil on the big Island. All these factors were merging and leading to the creation of Oshan. Each product has its own unique name, what do they all mean? The "After Sun Serum" is my favorite! How does it work? What ingredients do you use? This manoʻi is composed of 13 different botanical oils and extracts, each with a unique effect on the skin. Geranium provides nourishment to revitalize skin cells/ helps calm nerves and lessen feelings of stress. Rose Promotes an even skin tone and healthy complexion/ Emotionally uplifting ,stimulates a strong sense of well-being and positivity. Lavender aids in healing of all burns including sunburn, relieving tension and depression/ effective for headaches and insomnia. Patchouli is an effective anti- inflammatory for the skin /grounding and balancing effect on overall mood. Unlike regular lotions that are scented with synthetic fragrance, the mano’i provides double benefits -for the body and the mind. Tell us what your favorite product is? What are your future goals for Oshan? Through Oshan ,I strive to combine my passion for the environment and love of mindful living. I would like to inspire people to consume better, sustainable products, slowly changing our global concept of consumption, one person at a time. It is incredibly satisfying to help other women, many of which are my muses- surfers who spend long hours in the sun- and to better their lives with my product line.